If you are not the gala type, not to worry! This is not your typical gala event. Leave the suits, ties, and high heels at home, and put on your best “summer camp chic” attire. We are taking you back to your camp days of making friends, singing songs, and most of all – having a blast! P.s. Did we mention that the one and only Fred Penner will be there!? Businesses have donated some amazing items for our “Tuck Shop” silent auction and we will be having a liquor raffle for some lucky winners! There won’t be any fancy toasts, but there will be a s’mores station and a three course family style meal. 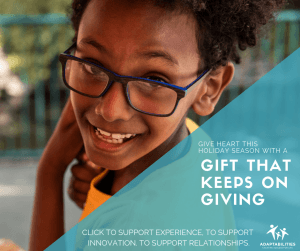 Most importantly, by attending the event you’ll be supporting our Hearts in Action summer camp and helping families who face financial barriers. Last year we raised $62,037 and sent over 50 kids with disabilities to camp! Hearts in Action is not your typical summer camp; each day a structured routine offers participants recreation and motor development, essential life skills, and expressive art activities. We have seen first hand the positive effects camp can have, but at the event you’ll hear stories from our campers and an unforgettable video journey of six incredible AdaptAbilities champions. Tickets to the event are only $50, and there are table and sponsorship opportunities available as well. So what are you waiting for? Get your tickets and join us around the campfire.